After the international success of their first operatic venture, The Handmaid�s Tale in 2000, it was only a matter of time before Poul Ruders and his British librettist Paul Bentley collaborated again. For their second venture, they have chosen Kafka, an author both men feel deeply about. The resulting piece was chosen as part of the opening season of the newly-built Copenhagen Opera, which at least ensured a sell-out. It has its moments but some may feel that Bentley�s struggle create a feasible dramatic framework and coherent libretto are, at best, a mixed success. As in the previous work, the concept of a dual reality is at the core. Bentley weaves a series of scenes from Kafka�s unfinished novel The Trial with episodes from the author�s own life, told largely through the many letters that chronicle his difficult relationship with two women, the cool Felice Bauer and the rather promiscuous Greta Bloch. Thus we have two parallel triangles presented on stage, Kafka and his two lovers and Josef K. with Fräulein Bürstner and Fräulein Montag. If it sounds complicated, it�s obviously meant to be, with the added dramatic irony of the same three singers taking all six parts, though it�s fair to say that there may have been more clarity in the opera house than this purely aural experience. The 27 minute prelude that opens the opera bustles with nervous energy as the letters fly back and forth over a number of years. Ruders� musical language is as eclectic as ever, with Ligeti-like clusters and dissonant brass outbursts rubbing shoulders with smoochy Hollywood strings and café dance tunes. The whole thing moves at a real lick and rhythmic undercurrents are strong � one can at times see why he has been called Europe�s answer to John Adams. He slips between these styles with effortless ease and I would say that the musical side of things leaves the strongest impression with this opera, especially given the superbly committed playing and singing. 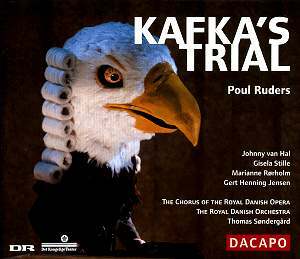 The difficult central role of Kafka/Josef K. is ably taken by Johnny van Hal, a regular at the Danish Opera. He has a tremendously difficult task here, both technically and interpretatively and it�s to his credit that he invests real life into these tricky theatrical creations. Vocally he only shows strain towards the end, quite understandably given the huge size of the part, which must have been tour-de-force to learn, but he shows great flair in the moments of pure slapstick that Bentley and Ruders occasionally conjure up. Again, it would be nice to see the performance in these more manic episodes. The two principal women are outstanding, particularly Marianne Rørholm, a Ruders favourite and the creator of the central character of Offred in The Handmaid�s Tale. All other parts are excellently done but the real praise must be reserved for Sondergaard and his orchestra. Ruders� demanding score is brilliantly realized, its considerable stylistic challenges met head-on in playing of richness and fluent virtuosity. Praise must also be given to Da Capo�s presentation, a model of its kind. There�s a handsome 273-page booklet, complete with full text and translation (utterly essential here) as well as decent background notes and interviews with composer and librettist. Sound quality is also first-rate, with what sounds like an enviable acoustic very well caught. Those keen on Ruders need not hesitate, but overall I�m left with the nagging feeling that this production would be best served on DVD, where the plot complexities and many character doublings would possibly be easier to unravel, to say nothing of the whole thing fitting easily on one disc. It wouldn�t surprise me if it happens eventually, but those who can�t wait will be pretty well pleased with this set.